One of the best parts of a birthday party is blowing out the candles on your birthday cake. How many candles will you have on your next birthday cake? In this puzzle, you need to figure out how many candles need to go on top of each birthday cake. Can you do the sum, then draw on the correct number of candles? The first one has been done for you. Good luck! 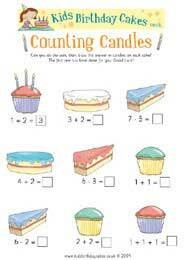 Why not Download the Counting Candles Numbers Puzzle and see if you can find out how many candles need to go on each cake. This activity is aimed at 4 to 7 year olds, it's a fun way to help build your child's maths and problem solving skills - and it makes a great party game!